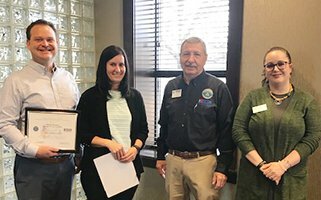 At a program March 18 at Davenport Evans, Don Kelpin and Amy Haar of the South Dakota Employer Support of the Guard and Reserve (ESGR) presented Davenport Evans lawyer Mitch Peterson with the Patriot Award. The Patriot Award reflects the efforts made to support citizen warriors through a wide-range of measures including flexible schedules, time off prior to and after deployment, caring for families, and granting leaves of absence if needed. Peterson was nominated by Angela TerMeer, a paralegal at Davenport, Evans, Hurwitz & Smith, LLP and a Technical Sergeant for the 114 Fighter Wing of the South Dakota Air National Guard. TerMeer has been a member of the South Dakota Air National Guard for seven years, having served a total of 16 years in the military, including nine years of active duty. Angela says she has depended on her employer for the support provided during her time with the Guard, an experience she wanted to recognize through the award. We at Davenport Evans wish to thank Angela for her dedicated service to our country.